Are you a Parent or Carer with looked after, adopted or vulnerable children? We asked 20 of our BraveHeart trainers (all adopters or foster carers) what their top tip would be for parents and carers in working with their child’s school……here is the result. Do you wish your school understood your child better? Do you wish you could get them to listen to what you’re saying about your child’s needs? Do you wish your school would stop the punitive systems and look behind the behaviour? Do you wish your school would take you seriously and treat your child as an individual? Many wishes that I’ve had over the years as an adoptive parent to three teenagers. It’s not for want of trying to engage with schools, but sometimes maybe in our enthusiasm we may hinder that partnership unintentionally. 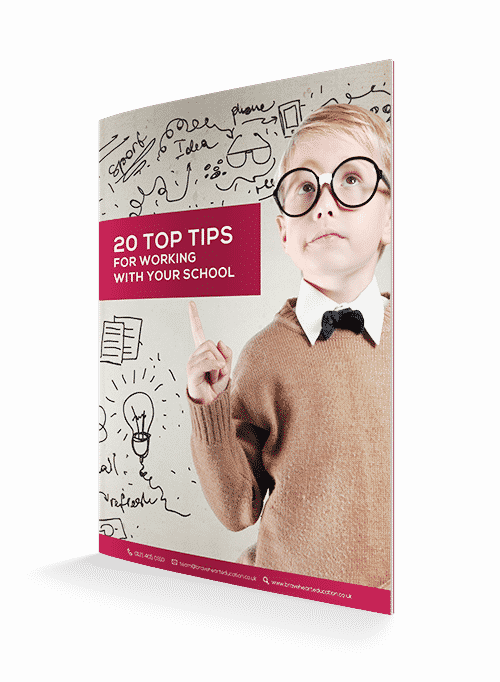 A FREE downloadable copy of our 20 Top Tips on working with your school. We hope it will help you to build a better relationship with your school and in turn make a positive difference for your child’s experience of school. All you need to do now is to fill in your details below and I will send you a copy of the top tips. I’m so pleased that you are interested in the work of BraveHeart Education as I am really passionate about getting this message out to as many parents and carers as possible. Our core message is that children who have experienced trauma in their lives need a different approach within our educational settings.